As a new year begins, there’s always the desire to reflect on what was and what can be. We’re not really in the business of predicting the future (unless we’re debugging of course, then that’s definitely our business), but there’s plenty to look back on when it comes to 2018. Things soared and fizzled, companies were bought and sold. What’s clear is 2018 was a year with incredible impact when it comes to the developer world. Here are 5 things that helped define .NET’s 2018. .NET Core 2.1 and 2.2 were released and made huge performance improvements. .NET Core 2.1 heavily utilizes Span<T> and Memory<T>. The result is amazing performance improvements. In fact, it now outshines Node.js and is one of the fastest existing platforms.Core v3 has already been announced, supporting desktop applications, AI and machine learning, and IoT apps. It seems that 2019 should be just as big a year for .Net Core, if not bigger. While .NET Core moves fast, it seems clear that the .NET Framework is “Done”. With Microsoft now able to innovate through .NET Core without risking breaking compatibility for billions of existing .NET Framework installations, it seems unclear at this point whether there will ever be another release past .NET 4.8. 2)The death knell of the virtual machines. 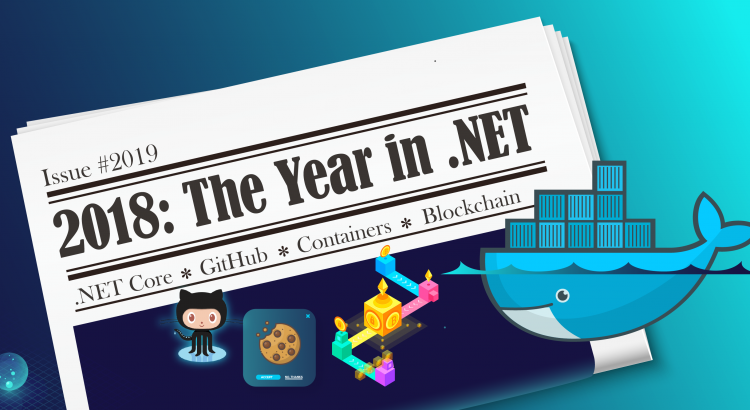 Docker has been big for a while, but it had a banner year in 2018. To top it off, Kubernetes has established itself as the go-to orchestration platform. If there was any doubt at all about the future of Docker, that’s now been quashed. Containers for Windows finally got some much-needed support, and Microsoft will be making that support even better with Windows Server 2019. Windows containers are going to become as similar as they can possibly be to Linux containers. As far as the cloud, starting the end of 2017 and throughout 2018, Azure launched Azure Kubernetes Service (AKS), Azure Container Registry (ACR) and Azure Container Instances (ACI). AKS, in particular, was a huge success. Service Fabric Mesh is currently in Preview as well and combines all of the goodness of Service Fabric with Containers. 3) The rise and fall of blockchain. There was a moment this year when all you had to do was drop the word “blockchain” in front of an investor, and you’d be showered with money and goodwill. But alas, buzz only took blockchain so far in the world, and people were met with a rude awakening. Bitcoin hasn’t gone the way of the .com boom(yet), but 2019 is looking bleak for crypto and blockchain. The crypto bubble burst this year, and it did it with a bang. The biggest impact on the software world came in the form of blockchain-related startups, that were sprouting all over the place. Now, after the crash, things seem pretty bleak for those startups. Investors are no longer keen on blockchain, currency trade is much slower, and many startups are on the verge of collapse. In the interest of fairness – blockchain is a great bit of technology, but, it’s not going to take the place of real currency any time soon. While not strictly a .NET thing, the entire enterprise software world was deeply affected by GDPR. The General Data Protection Regulation said “hello world” in May, sending tech companies scrambling to figure out how to comply, or risk gigantic fines. This EU legislation was the opening salvo in what will most likely be a long and drawn out battle over the use of personal data. To avoid the regulations, some companies just decided to abandon the EU altogether and not deal with it. But that’s a futile gesture. As the last few months of turmoil with social media companies have started to reveal, the floodgates have opened, and more countries are sure to follow suit. The biggest impact on programming seems to be with Big-Data projects. We don’t have inside information but it’s a reasonable guess that some of these projects were considerably changed or even canceled in order to comply with the new GDPR rules. Then again, it’s also a reasonable guess that some of these companies are too invested in those projects and are willing to risk breaking the rules. 5) GitHub bought by Microsoft. The deal to acquire GitHub for 7.5 billion dollars was announced in June, and closed in October. 2018 was overrun by a fiery debate over whether the acquisition will change the product. It seems that speculation was just that – speculative. GitHub users seem to have survived the acquisition unscathed, and the only result so far seems to be better integration with Azure Pipelines. It’s quite possible that the rebranding of VSTS to Azure Devops is part of the master plan to improve integration with Azure overall. Time will tell how everything else shakes out. It’s safe to say that all in all, 2018 will be one for the books. Here’s to a great 2019!